It's been decades since the first pieces of the Dead Sea Scrolls were found in the caves of the Judean desert, but yet another piece of parchment bearing 2,000-year-old scriptures - verses from the Book of Leviticus - was found just recently. Such finds demonstrate that the Holy Land can still produce ancient treasures, thousands of years after the events described in the Bible. Click the "Next" label to learn about seven more archaeological discoveries in recent years that have shed light on Jewish history and the Old Testament. A 6-by-6-inch pottery shard unearthed at the archaeological dig site of Hirbet Qeiyafa (the Elah Fortress) in Israel, shown here, contains five lines of faded characters that may bear the oldest Hebrew inscription ever found. The 3,000-year-old text dates to the time of the Hebrew Bible's King David and is thought to be written in proto-Canaanite, a precursor to the Hebrew alphabet. 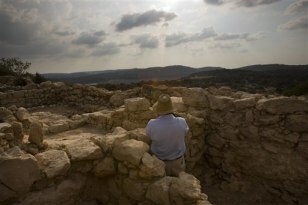 While other people used proto-Canaanite characters as well, the inscription contains a three-letter verb meaning "to do" that existed only in Hebrew, according to Yossi Garfinkel, a Hebrew University archaeologist in charge of the dig. "That leads us to believe that this is Hebrew, and that this is the oldest Hebrew inscription that has been found," he told the Associated Press. Other scholars, however, have urged caution until more is known about the inscription and its context. The Book of Nehemiah describes the construction of a wall as part of a rebuilding project after Jerusalems destruction by the Babylonians. Archaeologists think they have now found the wall. Their case rests on the pottery pieces and other artifacts shown here. They were discovered near a wall that was previously thought to date to the Hasmonean period of Jewish history (142-37 B.C.). These pottery pieces date to the 5th century B.C., which suggests that the wall is older and corresponds with the time of the biblical account. Other archaeologists, however, are unconvinced. 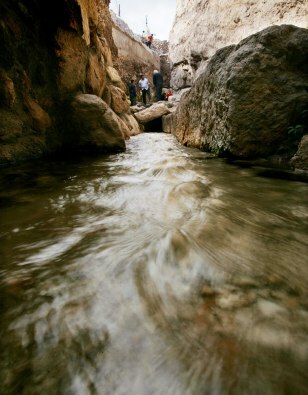 In this image, water flows through a site where the remains of a pool serve as a link between Jewish rituals and a famous miracle said to have been performed by Jesus. The site, known as Siloam Pool, was used by Jews for ritual immersions before heading down to the Temple Mount. Jesus is said to have miraculously cured a man of blindness in the pool. Archaeologists have also found biblical-era coins with Jewish writing, pottery shards and a stone bottle cork — all helping confirm the authenticity of the site, located in what is now the Arab neighborhood of Silwan. 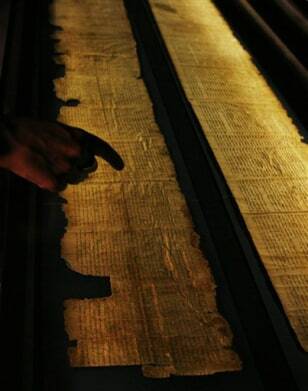 The ancient texts known as the Dead Sea Scrolls are considered one of the greatest archaeological finds of the 20th century, yet to this day they remain shrouded in mystery and controversy. The 2,000-year-old collection of writings, which includes the earliest surviving pieces of the Bible such as the Book of Isaiah, shown here, was discovered in 1947 by a Bedouin shepherd in a cave above the ancient settlement of Qumran. 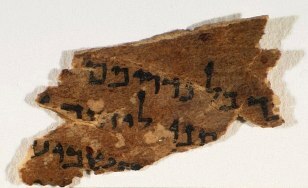 Conventional interpretations hold that the texts were authored and stored by the Essenes, a hard-core Jewish sect thought to have occupied Qumran at the time. However, in recent years this view has come under attack by scholars who believe Qumran was a fortress or pottery-making facility that had nothing to do with Essenes. These scholars contend that the cave was just a convenient storage locker of sorts for Jews fleeing the Roman siege on Jerusalem in the year 70. 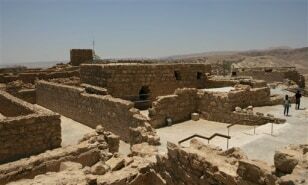 Archaeologists excavating King Herod's winter palace in the Judean desert continue to unearth what appear to be the remains of the ancient ruler's tomb. 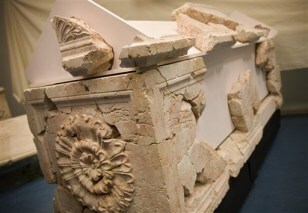 The sarcophagus shown here was pieced together from scattered fragments of a mausoleum archaeologists believe was smashed apart by Jewish rebels who reviled the king as a Roman puppet. Herod was the Jewish proxy ruler of the Holy Land under Roman imperial occupation from 37 to 4 B.C. After his death, scholars believe the palace became a stronghold for rebels fighting the Roman occupation. The rebels were defeated, and the palace destroyed, in the year 71. When the Romans sacked Jerusalem around the year 70, Jews took refuge in a network of underground tunnels and chambers, archaeological finds have revealed. 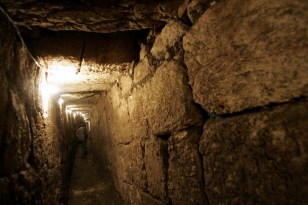 This image depicts one of the tunnels dug beneath the main road of Jerusalem during what is known as the Second Temple era. 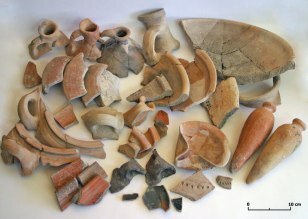 Pottery shards and coins from the end of the era attest to the channel's age, according to one of the project's researchers. Elsewhere in the city, archaeologists have uncovered chambers filled in with supplies, an indication that the ancient Jews prepared for the uprising. The mountaintop fortress of Masada overlooking the Dead Sea is famous in Jewish history as the final holdout for about 900 rebels who chose suicide over capture by the Romans in A.D. 73. The story plays a central role in Israel's national mythology, though recent studies have cast doubt on its credibility. Some scholars think the mass suicide was greatly exaggerated or never happened at all. In the 1960s, archaeologists found two male skeletons and the braided hair of a woman in a bathhouse - and the Israeli government gave those remains a state burial in 1969, thinking that they came from Masada's Jews. More recently, however, some archaeologists have suggested that the remains were actually those of the Jews' Roman enemies. Despite the recent controversies, the Masada fortress, seen here, remains one of Israel's top attractions. A cable car carries visitors to the top of the rock.